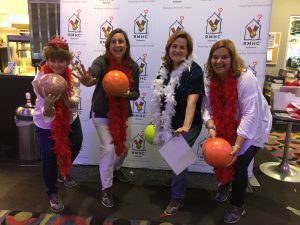 Supporters and new friends alike had a great time bowling for RMHCA Friday, April 20 at Oak Mountain Lanes in Pelham! 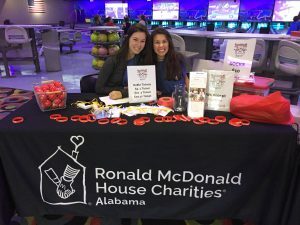 The 5th Annual Bowl-a-palooza, hosted by RMHCA’s Student Leadership Council, raised $3,156 for the charity. The entry to the event included three hours of bowling, unlimited soft drinks and a t-shirt. 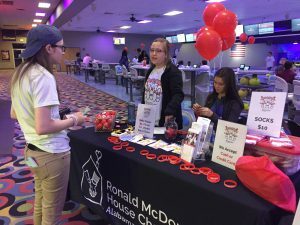 The students also hosted a raffle with sought-after prizes like gift cards to Cowfish Sushi Burger Bar, RMHCA swag sets and Bowl-a-palooza themed cookie cakes. 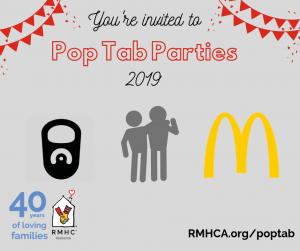 RMHCA is proud of our Student Leadership Council for organizing and executing this event. We’d also like to thank Oak Mountain Lanes for working with us for a second year and to all our sponsors: Avanti Polar Lipids, Backus Orthodontics, Creative Daycare Academy, The Dannon Project, Diversified Maintenance, Eagle Service Company, Fish Market Restaurant, Golden Rule BB!, Great American Cookies, Jade’s Salon, Freddy’s Frozen Custard and Steakburgers, Professional Choice, the Read Family, Recept Pharmacy, State Farm Agent Chris Dorris and Syscon. We hope everyone had a great time and we’ll see you next year for the next Bowl-a-palooza!